It’s not a surprise that, at NetBeez, we love the Raspberry Pi! This little device can do magic on wired as well as wireless networks. Few weeks ago, Panos posted an article that offered some examples on how to use the Raspberry Pi for distributed monitoring with Iperf. Here, I want to talk a little about using this platform, or any other Linux client, to connect to enterprise wireless networks. First of all, there are different types of security settings that can be used for wireless networks. In the section below, I want to list each of one them, from the weakest to the most secure option and shed some light on all options available. This configuration does not require any password. The wireless client simply connects to the open SSID. This is the case of a coffee shop, like Starbucks, or of an enterprise’s guest internet access that offers free wireless services to its customers. Typically, a client that accesses such a free wireless service is redirected to a captive portal where it has to accept the terms and conditions of service before being able to use the network. WEP-40 also known as WEP-64: It uses 40 bits of key and a 24-bit initialization vector. It can be also expressed with a string of 10 hexadecimal characters (remember 4 bits for 1 hex). WEP-104 also known as WEP-128: It uses 104 bits of key and a 24-bit initialization vector. It can be also expressed with a string of 26 hexadecimal characters. A Pre-Shared Key (WPA-PSK) that is convenient for a home or small office environment. In this setup, all the users share the same password so if this is compromised or one of the employees leave, you will have to change the password and update your access point and wireless clients. The Extensible Authentication Protocol (EAP), a framework that support different authentication methods. This is a form of enterprise authentication that creates a unique authentication profile for each user. The EAP framework will be discussed in the next paragraph. Also known as IEEE 802.11i-2004, WPA2 only uses CCMP as the encryption algorithm. As with WPA, the authentication on WPA2 networks can be based on pre-shared keys (WPA2-PSK) or on the EAP framework. The WPA supplicant software (available here) is not mandatory if you are connecting your wireless client to a home network that uses one of the pre-shared key methods (WEP, WPA-PSK, WPA2-PSK) to authenticate its clients. Since in our case we want to deploy our wireless client in an enterprise network, the WPA supplicant software it is needed. Wireless enterprise networks generally use one of the most common WPA or WPA2 Extensible Authentication Protocol (EAP) methods, such as PEAP, EAP-TLS, EAP-TTLS, and LEAP. Leave default value for WPA/WPA2 networks. There are many variations of the Protected EAP method, but the PEAPv0/EAP-MSCHAPV2 is generally the most common configuration that is used in an enterprise environment. This authentication protocol requires the server-side public key certificate to establish the secure TLS tunnel (PEAPv0) that protects the transmission of the user credentials (MS-CHAPV2). This method is very similar to the PEAPv0/MSCHAPV2 method. A server-side public key certificate is used to authenticate the server and establish a secure tunnel through which the client credentials are transmitted. The client can be authenticated via a CA-signed certificate with the server or just authenticates via traditional username and password credentials. This method was developed by Cisco before the ratification of the 802.11i standard and is supported by a wide range of operating systems (Windows, Linux, Mac) and wireless vendors. LEAP supports Windows NT/2000 Active Directory profiles and authenticates against a RADIUS server. For this reason, LEAP was largely adopted in wireless enterprise environments and may still be used by several organizations. However, since it relies on the MS-CHAPv2 authentication protocol, it can be exploited, so it is highly recommended to use it with complex passwords or to adopt, if possible, a different EAP method. I hope that this post was beneficial to shed some light on how you can configure your wireless Raspberry Pi, or Linux client running a WPA supplicant, to connect to a wireless enterprise environment. 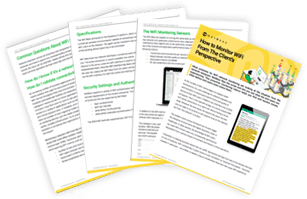 If you want to learn more about NetBeez and WiFi monitoring with Raspberry Pi, download this guide.